Chapman Drive Trail, aka Flagstaff Summit Road, which connects Boulder Canyon Drive at the Red Lion Inn to Flagstaff Road via the north-west side of Flagstaff Mountain will now be open thanks to several initiatives that are now complete. In December, Boulder Open Space and Mountain Parks removed old rotting pipes from the cattle guard and reconstructed the switchback about a mile down from Realization point which had collapsed in two places. The city recently purchased the Schnell property in order to complete the plans to finish the Chapman Drive Trail and finally the bridge connecting Boulder Canyon Drive to the Red Lion Inn was rebuilt after it was destroyed two and a half years ago due to heavy floods. The bridge will officially open Jan 7, 2013 and the trail will be open to hikers, runners, and equestrians but will not allow dogs. Bikes are reportedly allowed to travel uphill initially according to the Trail Around Boulder Facebook page but there may be refinements to these rules after they trail has opened. This connector trail was often used by the CU Cross Country team as their Wednesday workout as noted in the book “Running with the Buffaloes” as the team would climb the Flagstaff MountainTrail then drop back down into Boulder Canyon and back to the Boulder Creek Path to complete a 13 mile loop. 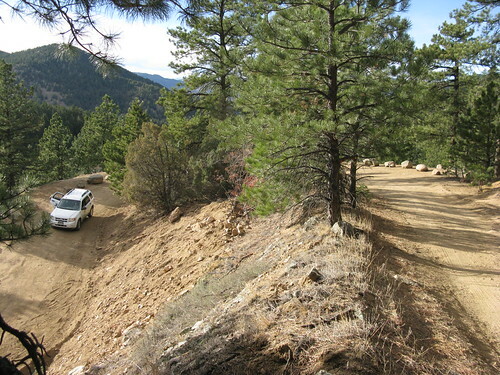 The 2.6 mile trail starts just above the Realization Point Trailhead on Flagstaff Road at 6,780 feet, connects with the Tenderfoot Trail about a mile down and finishes in Boulder Canyon at the Red Lion Inn (elevation 5,850′) ~.5 miles up the road from the terminus of the Boulder Creek Path at Four Mile Canyon. About a 930 foot ascent if you are climbing from the canyon. On your travels, be sure to look for the stone embankments, walls, pilasters and the cattle guard that lines the trail. The switchback was repaired and rebuilt to resemble the original work done by the Civilian Conservation Corps. An historic preservation masonry specialist was consulted on the project where the original walls were mechanically stabilized and the mortar repaired while newly built walls resembled the style of the original rock work.